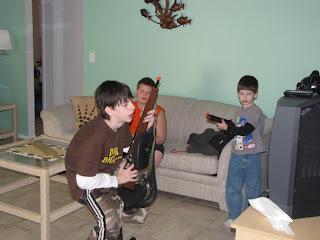 The next day we checked in the house we were renting for the rest of our stay. It is so much better to be in a house than a cramped hotel room. The home we were renting was 4 bedrooms with a heated pool. We rented through VRBO.com. You can pick and choose your house by area, bedrooms, and price. Ours was $590 for 5 nights including taxes and pool heat. That is a great deal considering there were 8 of us. 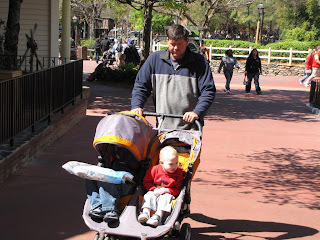 We also rented a stroller for our stay from Orlando Stroller Rentals. We could have brought our own, but we really needed a double so Barb's youngest could ride too. The stroller place was great. They met us early in the morning near the park, so we could get to the park on time. They also picked up the stroller on the last day from our rental home. The stroller was very nice and easy to push. This was a lot cheaper than renting a double stroller from the parks. Disney charges $31 a day for a rental. Orlando Stroller Rentals was only $85 for the whole week. 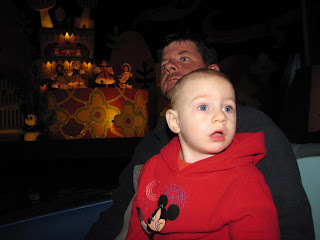 My youngest loved It's A Small World. He kept pointing at all the colorful scenes. 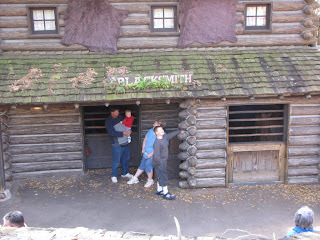 The oldest liked Tom Sawyer's Island because of all the caves and guns. 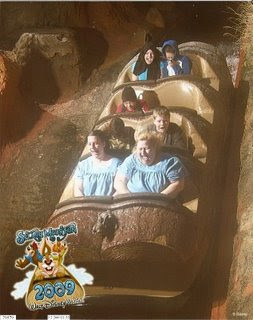 My favorite ride at The Magic Kingdom is Splash Mountain. That's me on the right side in the front. Barb is on the left and our oldest sons are in the seat behind us. Here is a video of part of the fireworks show at the Magic Kingdom. It's called Wishes. Hopefully you won't hear me singing in any of it! Looks like so much fun, especially the splash ride! Your little one's eyes are so wide with excitement. What fun! I love the photo of you & Barb on that roller coaster. Just two little grown up girls ... the best way to be. You look so cute on the splash ride! What fun! It sounds like you got some fantastic rates on the house and stroller... Way to go!!! You got some great pictures! Looks like y'all had a lot of fun!